Dr David Shankland is the Director of the Royal Anthropological Institute. He trained in Social Anthropology at the University of Edinburgh, then moved down to Cambridge for his doctoral studies, during the course of which he conducted fieldwork in Anatolia, looking in particular at questions of social change, politics and religion. In 1995, David took up a lectureship in the University of Wales Lampeter, thereafter moving to the University of Bristol in 2003. 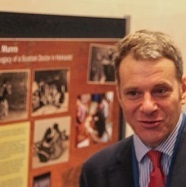 He has played a leading role in many anthropological institutions, being the co-organiser of the European Association of Social Anthropologists conference at Bristol, the Chair of the ASA conference Anthropological and Archaeological Imaginations: past, present and future, and in 2009 the President of the Anthropology and Archaeology Section of the British Science Association.